Ninja Nonsense DVD Review. While I don’t recommend this anime for most readers, if your humour suits what I mentioned in the first paragraph, you might find it the complete opposite of this review. Ninja Nonsense is quoted as an explosive anime comedy. It really didn’t suit the bill in my case however. If humour along the lines of “Look at this flip book of a guy shitting in reverse, look at him sucking it back in” is funny to you, by all means watch it, you’ll probably get a few laughs. The only way I can truly describe this anime is bizarre. 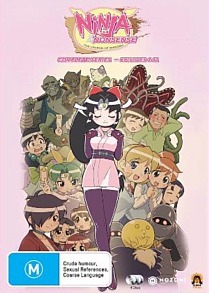 The anime follows random encounters and events that happen after Shinobu, a trainee ninja girl without any skill, meets Kaede, a regular girl, while performing a perverse mission for her ninja headmaster, Onsokumaru. The girls form a friendship and begin to spend time together a period of a year. Miyabi is Shinobu’s younger sister, and far superior to Shinobu when it comes to being a ninja. The final episode involves Shinobu leaving for England for further ninja training (which seems random and not really focused on in previous episodes at all), and then returning a few days later because she was a bad ninja. Shinobu has a semi-lesbian love for Kaede. Onsokumaru runs a perverse dojo where all of the members other than Shinobu are male, and all spend half of their time trying to get Shinobu or Kaede, or looking at women in magazines. However, the male ninja tend to side with Onsokumaru in his perverse schemes, if he tries to go too far, they act as restraints within the series. The drawing quality was a little below the standard Anime, but it’s nothing that would stand out. The girls all have high pitched voices that if you listen to for extended durations; you will need a break from before they give you a headache. While I don’t recommend this anime for most readers, if your humour suits what I mentioned in the first paragraph, you might find it the complete opposite of this review.